UAA Theatre and Dance students perform the play “Rain and Zoe Save the World” on the main stage of UAA’s Fine Arts Building. 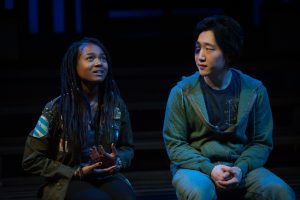 Of more than a hundred scripts submitted to the 2018 Earth Matters on Stage (EMOS) New Play Competition, New York based playwright Crystal Skillman’s Rain and Zoe Save the World was selected as the winning entry and is being produced by The University of Alaska Anchorage Department of Theatre. This week on Stage Talk, director Ty Hewitt drops by to talk about EMOS as well as the play which follows two Seattle teenagers on an across the country motorcycle trip that results in them learning more about themselves than they ever anticipated. Rain and Zoe Save the World performs April 27-29 at the UAA Mainstage located in the UAA Fine Arts Building. ORIGINAL BROADCAST: Friday, April 27 at 2:45 p.m.